The model workshop is a 4 hour in-person intensive class for aspiring models of all experience levels. A workshop is currently held each season at the studio. CES directors give models a comprehensive overview of local and international industry standards then move into breakout sessions for hands on work which provide 1-on-1 coaching regarding how to apply this information to your individual goals as a model. Models are required to wear aN all black, tight "casting" outfit to have digitals photographed. Models of all height, weight, gender, genre, skill and interest levels are welcome at the CES workshop. Workshop directors will meet you where you are and tailor the information to your modeling goals. Get name tags, coffee, and find a seat. TIP: Use this time to mingle with your peers and gain confidence introducing yourself. They may know a great photographer, or be a new instagram follower. Personality is key, let yours shine! Directors welcome models, introduce themselves, and highlight their industry experience. 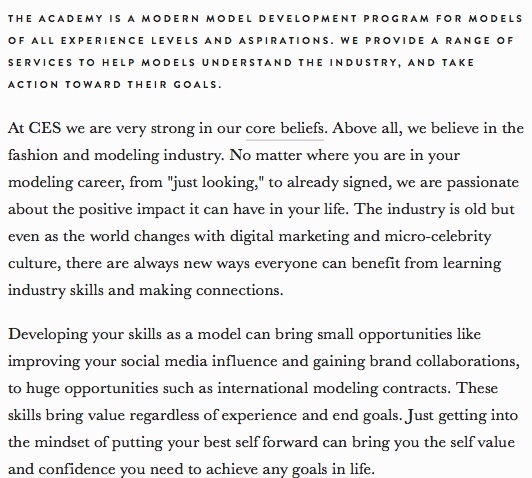 Models will also introduce themselves and their experience and goals for the industry. Directors teach in depth covering a variety of topics; local and international standards, agencies and managers, how to read a contract, traveling to work, and pay. Review your portfolio or social media presence with a director. Learn whats missing and how to put your best self forward when submitting to agencies or management. Photograph professional modeling digitals to add to your portfolio or comp card. Practice your walk 1-on-1 with a director and run through posing exercises as a group. Have your measurements updated and recorded and learn how to do them yourself. Sit down as a group and ask any final questions to the team. Cofounder of CES Limited; Lead photographer for The W Brand and educated in Art Administration with The Ohio State University. Cofounder of CES Limited; International model represented by Toxic Model Management, LVX, Modelight, D&D, and PaceTimo. Fashion Director & Production; Established with New York, Los Angeles, Miami and Columbus fashion weeks and Fashion Meets Music Festival.